What do a group of sleep-deprived, caffeine-driven technology professionals at a weekend-long event and giving have in common? It’s GiveCamp — a time for volunteers like me to give to those who give to others every day. Over an all-too-brief 36 hours during the first weekend of November, GiveCamp volunteers, including software developers, designers, and database administrators, donated their time to complete custom projects for 15 local nonprofit organizations. In total, 143 volunteers donated 2,400 hours — $180,000 worth of labor. This is what giving is all about! For the volunteers, it was a successful weekend of giving time, sharing valuable knowledge, and making unbreakable connections. As a team leader, it was rewarding for me to connect with four skilled developers for the purpose of creating a new brand identity and website for Access of West Michigan — providing tools to help them continue their good work. Access “strengthens and develops holistic solutions to poverty by educating our community and connecting people and resources to cultivate just and equitable systems.” Our GiveCamp team contributed a weekend of time to help them give back to their community, and change lives and businesses for good. I highly recommend that any designer, developer, or marketing individual look into GiveCamp next year. Not only will you do good work and feel great about it, you will meet amazing people who love doing what you do, spend a weekend creating remarkable projects for deserving people and their organizations, and cultivate deep connections with our community. What seemed at first to be a small gesture, truly has been a great reward. 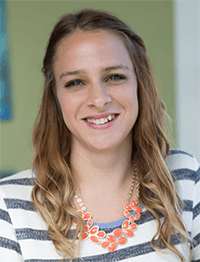 Amber Darsch is a graphic designer at the Johnson Center. She designs visual interfaces, research reports, web dashboards, and data visualizations for our Community Research Institute.